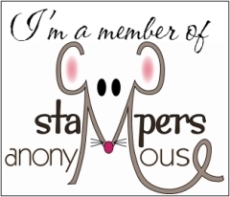 Starting today, Marelle Taylor’s Stampers Anonymous Team, will be hosting a Team Blog Hop on the 14th of each month. Our Hop will hopefully inspire you with new ideas and products to create with. This month we have a nice easy sketch to work with. This sketch was created from the card on page 97 of the Annual Catalogue. Lets see how everyone has adapted the sketch to suit other stamp sets. I’ve created a very simple card using the gorgeous ‘Love What You Do’ Stamp set. I stamped the background wash in Pear Pizzazz, the flower image in Memento Tuxedo Black and then Gorgeous Grape (stamped off once) to give some colour to the flowers. My sentiment has also been stamped in Gorgeous Grape. I’ve used the Detailed Trio Punch on the corners and the Everyday Label Punch for the sentiment. You can make your way around the hop or back to the previous blog by clicking the buttons below. Feel free to leave us comments and let us know what you like about our creations along the way.